White Tara represents the enlightened and liberating activity of all the Buddhas. She embodies the motherly aspect of universal compassion. Her compassion for living beings and her desire to save them from suffering is said to be even stronger than a mother's love for her children. White Tara, the Mother of all Buddhas, is known for her swiftness in responding to the prayers of those who invoke her name. Her right hand is open towards us in the gesture of supreme generosity, signifying her ability to fulfill our spiritual and material needs. Her left hand is in the gesture (mudra) of bestowing blessing, refuge, and protection. White Tara meditation practice is said to grant health, long life, fearlessness, patience, and peace. As Manjushri is the celestial Bodhisattva who represents the wisdom of all Buddhas and Avalokiteshvara is the one who represents all their compassion, Tara is the Bodhisattva who represents the miraculous activity of all the Buddhas of past, present, and future. White Tara has seven eyes – one in each hand and foot, and a third eye on her face – to show that she sees and responds to suffering throughout the universe; and she sits in full lotus in Vajra posture. Like the solitary form of the deity, the right hand is in Varada Mudra (gesture) of giving symbolizing supreme generosity, with the left hand holding the stem of a white blossoming lotus in a gesture signifying the Three Jewels. The fraction of White Tara is basically performed in the order to prolonged lift as well as for healing purpose. It is said that because Arrya Tara is the collective manifestation of the enlightened activity of all Buddhas, Sadhana is easily accomplished. The recitation of her Mantra merely a hundred thousand with the motivation of Bodhicitta will cause aversion of hindrances. 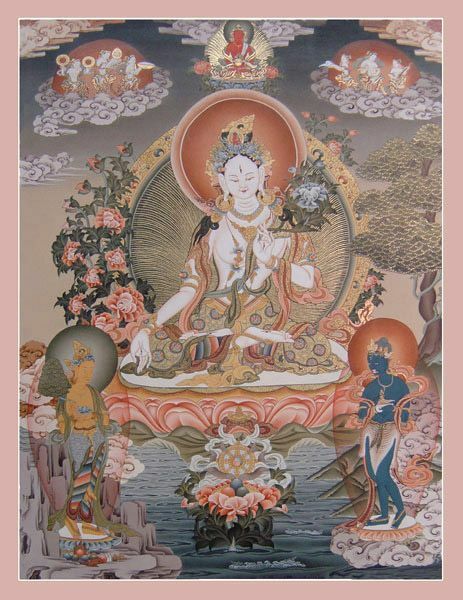 Painted: This wonderful high quality White Tara Thangka Painting is painted by the experienced artists of Nepal who have been in this business for generations. Availability: This White Tara Thangka Painting is shipped within 12 hours of order received through DHL or TNT Express and reached to the customer within 3 to 5 business days after it is shipped. Note: Please note that the actual colors of this White Tara Thangka Painting may vary due to differences in monitor color depth and make. The color shown is as close as possible to the actual colors of the Thangka Painting. The shape of this Thangka Painting may not look perfect rectangle in the picture but in real; the inner dimension of every Thankga Painting is perfectly rectangle since they are precisely measured while painting.